As a world-famous chef, it’s obvious that Chef Gordon Ramsay needs to know his way around a set of knives. 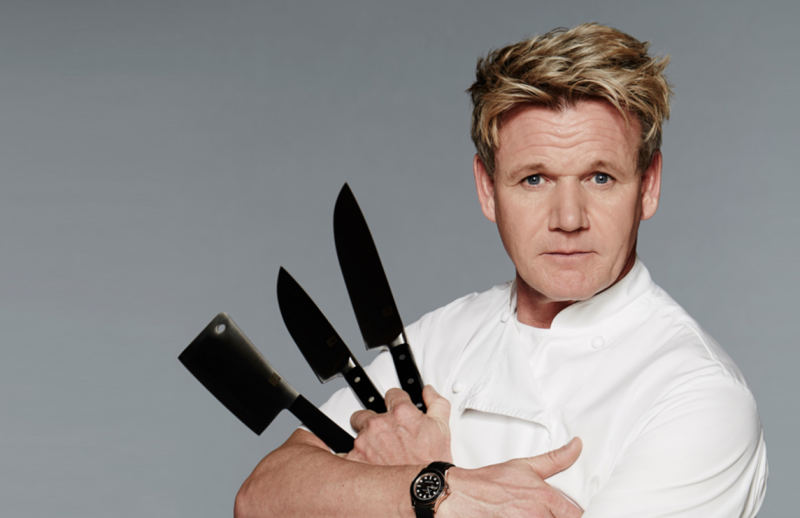 But you might not know about all of his most impressive and most memorable cooking experiences involving knives, which is why we’ve compiled a list of Gordon Ramsay’s top 10 knife moments! Ramsay may be the best of the best when it comes to cooking, but that’s partly because he’s using the best possible tools in the kitchen. Not content with just one option, Ramsay reveals his secret trio of knives that help him create his dishes. The first of them is a powerful chopping knife to deal with all the heavy duty prep that Ramsay needs to get done at work. This is teamed up with the second knife, a smaller and lighter paring knife. But the biggest knife of them all is Ramsay’s prized serrated knife, used for carving up the main course. Ramsay also has some friendly tips for anyone going knife shopping. Apparently, there’s more to choosing a knife than just grabbing anyone from the store. He explains that you need to experiment with picking up and holding knives until you find the one that feels right to you. If the handle is comfy to hold when you’re cutting, then you’ll be slicing and dicing way better than if you had an uncomfortable handle to work around. And of course, the heavier the knife you can find, the better your cutting will be. Keep to Ramsay’s knife basics and you can’t go wrong! One of many people’s greatest enemy in the kitchen is the common onion. Trying to cut one up can result in stinging eyes and start the waterworks running. However, Ramsay tackles these little monsters with absolutely no fear. In a video published on his personal cooking channel, Ramsay takes the time to demonstrate how to properly chop up an onion into fine slices. Ramsay starts off with a life-changing piece of advice – apparently, if you leave the root bases of the onion on when you cut it, the onion juices won’t bleed and make you cry. Thanks for looking out for us Ramsay! After that word of advice, he moves on to chopping the onion straight in half. 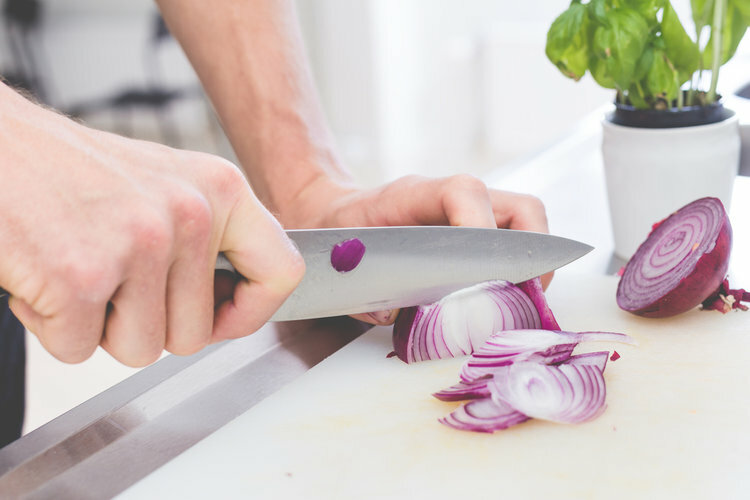 Things get a little more complicated when Ramsay demonstrates the proper way to hold on to the onion, with one of his finger knuckles leaning out to guide the knife. It looks dangerous, but it seems to work for him as he slices into the onion one way, and then cuts along the other direction to make tiny pieces of onion. Ramsay completes the task in no time, all without shedding a single tear. Ramsay’s already taught us the three most important knives that we need to buy, but what if they start going dull after a whirlwind cooking session? 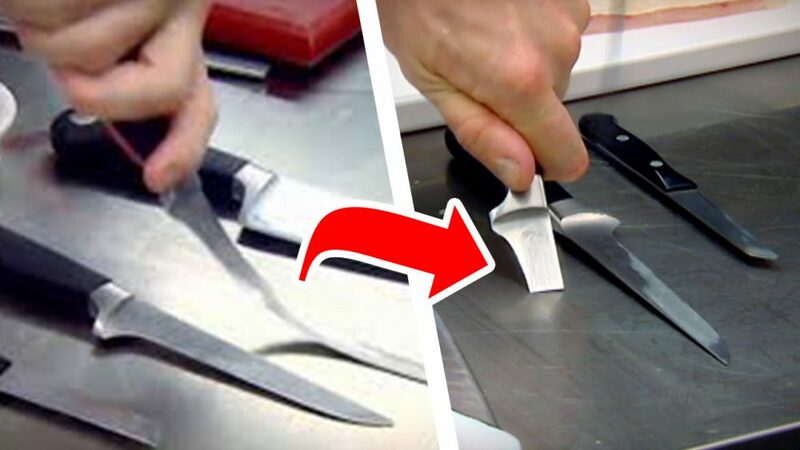 Luckily Ramsay is also a master of knife sharpening, and he shows the best way to keep a knife in pristine condition during a Youtube tutorial. Ramsay has high expectations, and suggestions sharpening a knife more than you might expect, every single time before and after you use it. First, he takes out a knife sharpening steel and says it should be held as if it’s just a safe tennis racket. 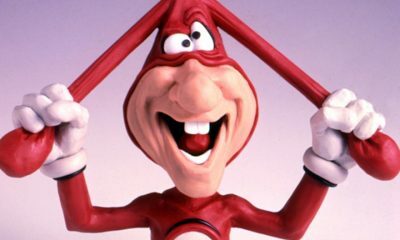 Wisely he reminds his audience to always keep their fingers behind the hilt of the steel, avoiding any potential slicing accidents. Ramsay makes it look easy as he sharpens the knife slowly, dragging the blade from the bottom to the top to fully restore it. Then he starts to amp it up, crisscrossing from the top to the bottom of the steel and getting faster and faster with his knife work. Ramsay is unconcerned about wielding a sharp knife, however, and instead starts talking about the dangers of blunt knives! At least during this demonstration, no knives were snapped! A lot of amateur chefs just buy their herbs dried or already prepared from the grocery store. But not Chef Ramsay. 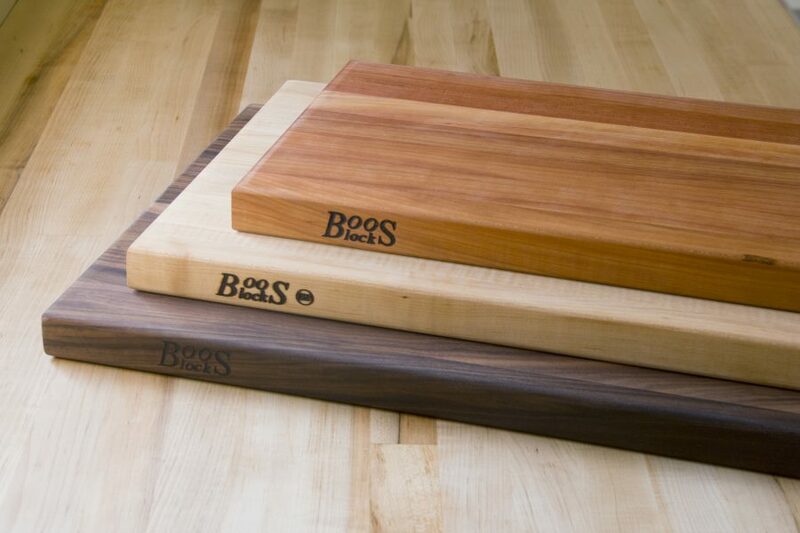 He likes to have his herbs completely fresh and prepare them himself, but he knows a way to slice them up without causing a giant mess and staining his chopping boards. Ramsay decides to teach a group of aspiring chefs his ways and starts off with showing the proper knife skills needed to prepare chives, without making a mess or losing flavor. He uses his same fancy finger trick as from the onion tutorial, urging everyone to use their finger knuckle as a blade guide and to protect the other fingers. 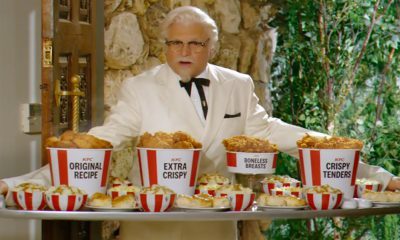 But he does have a word of warning this time, begging them to “Please be careful!” He then begins to cut the chives into extremely fine slices, without any of the herb juices staining the cutting board. After he’s satisfied with the chives, Ramsay moves on to the basil. He folds the leaves into each other and then rolls them up, all the while without bruising the fragile leaves. Then he turns the leaves into super thin strips with his quick and precise cutting. His audience was wowed by Ramsay’s talents, with some shaking their heads in wonder and mimicking his hand motions with the knife. We’re pretty impressed too! 6. Gordon Ramsay Snaps A Knife! We all know Ramsay for his awesome skills in the kitchen, but even the king of the culinary world has to slip up once in a while. On his television show The F Word, Ramsay was giving a mouthwatering tutorial on how to properly cook up brill, a type of flatfish. He gets off to a strong start, bustling around his kitchen and explaining the garnishes and sauces that he will be paring his seafood masterpiece with. Then, Ramsay shows a step by step lesson from inside his home on how to properly slice and break down the raw brill fish. 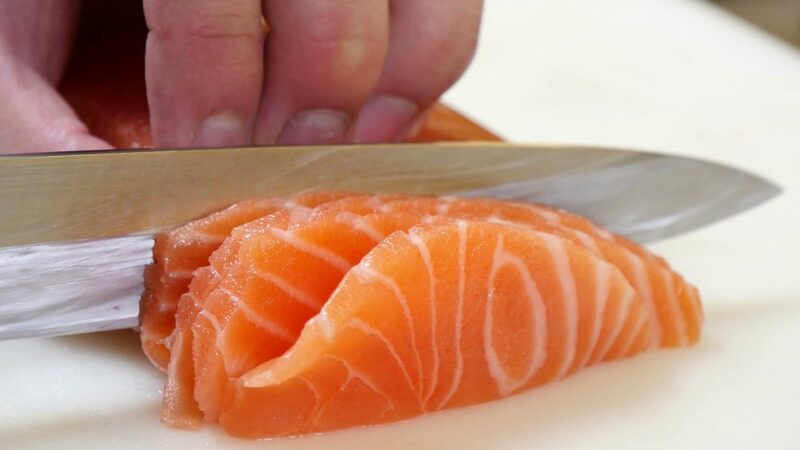 He proves his knife sharpening skills quickly before jumping into the fish preparation, cutting long strokes through the meat to create perfect fillets. When Ramsay tries to rehash this lesson in a real-world kitchen, however, things don’t go exactly as planned. He brings out a thin knife and explains that he has to just “let the knife do the work.” Unfortunately, Ramsay’s expectations are a little too high for this knife. He starts playing around with it to show off just how flexible it was, bending it against the hard metal counter in the kitchen. The knife finally has enough and the blade snaps in half, with part of it flying off into the air! Ramsay is startled but laughs it off, and the camera crew can be heard laughing at the mishap in the background as well. Luckily no one was hurt, and Ramsay might be a little more careful in the future! Ramsay has cooked beside numerous celebrities on his television shows and invited famous journalist Kate Silverton to appear on The F Word for a friendly cookoff. During the segment, Ramsay is in the middle of adding some spice to the apples he is cooking when he starts to chat with Silverton about her fiancé. Of course, he has to know whether or not the fiancé is a good cook and then moves on to the secondary questions like how they met. Apparently, Silverton’s fiancé is a security specialist who provides training for journalists traveling to volatile locations for stories, and he trained Silverton before she left for Iraq. Ramsay hones in on the fact that her fiancé is an expert in his field, and proceeds to ask her “And you find expertise attractive?” Obviously seeing his chance to woo her, Ramsay tries to show off his own impressive expertise by chopping up an apple with lightning speed. While Silverton admits that she does find expertise attractive, it’s clear that she isn’t quite wowed by Ramsay’s knife skills. He continues to rapidly slice up apples before giving up with a joking, “Come on!” He might not have impressed Silverton, but he definitely impressed his viewers. One of Ramsay’s other extremely successful shows is, of course, Kitchen Nightmares. In the fifth season of the UK show, Ramsay visits the disastrous restaurant Piccolo Teatro. Led by Brazilian head chef Daniel, the French restaurant is in shambles when Ramsay arrives. Daniel is extremely enthusiastic, dancing around his tiny kitchen and suggesting his best dishes for Ramsay to taste test. 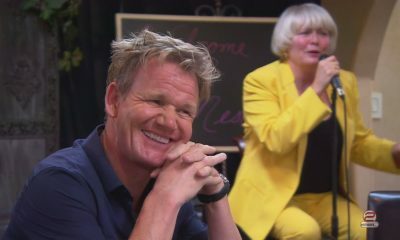 Ramsay simply sums up the restaurant with its eccentric chef by saying, “Welcome to the madhouse!” During dinner service, Ramsay watches in shock as Daniel slowly putters around the kitchen singing and procrastinating. The night gets worse and worse until ultimately Daniel has to be kicked out of the kitchen and sent home. 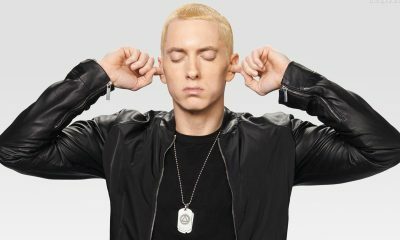 However, Daniel is not going quietly. He refuses to leave the kitchen and adamantly holds onto a knife, while Ramsay calmly tries to pry it off of him. They have a short showdown, with Ramsay asking for the knife over and over and Daniel holding onto it until he finally concedes and uses its to scrape food into the trash. Ramsay has had enough and decides to take matters into his own hands by throwing Daniel over his shoulder and literally carrying him away from the restaurant. Not one to shy away from a competition, Ramsay took on an actual knife skills champion for the Cookalong Live Show. As we’ve already seen, Ramsay has some serious moves when it comes to quickly and easily filleting fish. But he may have met his match when he was pitted head to head against Darren, the world record holder for cutting at least 40 pieces of salmon in one and a half minutes. 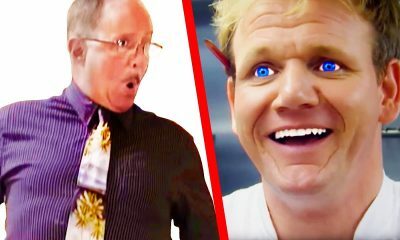 In the video, Ramsay meets with both Darren and a Guinness World Records official to see who will emerge victorious, and potentially create a new world record. Ramsay admits that he’s not his usual confident self, exclaiming “Why am I so nervous?” When the official sets the stopwatch, the men get to work slicing away at their respective salmon portions while a crowd looks on. Darren may have a thing or two to teach Chef Ramsay, because he breaks down his portion way faster than Ramsay, even jokingly asking if the chef needs a little help at one point! Each man had to produce 40 pieces of salmon, and Darren completes the task in a mere one minute and twenty-four seconds! Ramsay, on the other hand, lags behind Darren and makes a huge mistake by miscounting and only producing 39 pieces of salmon. While Darren wins a new world record, Ramsay is sent home to practice his knife skills a little more! As previously mentioned, Ramsay tends to attract a lot of celebrity visitors. This was the case when actress and singer Martine McCutcheon appeared on The F Word with Ramsay. 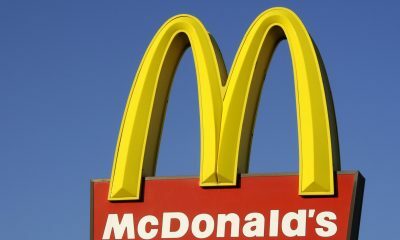 After tucking into a delicious meal that Ramsay had prepared for her, McCutcheon admits that she isn’t the best chef. Ramsay is not impressed when she tries to save face by saying that she can cook toast and microwave scrambled eggs. She doesn’t even have real plates, only paper ones! Ramsay decides that she’s in need of some culinary help, and pulls her into his kitchen for some education. 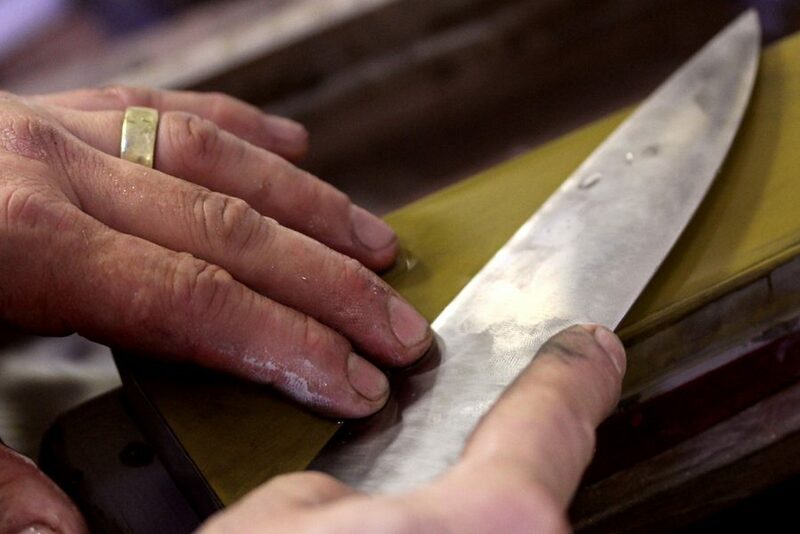 He chooses to start her off on a daunting task – how to sharpen a knife. While we already saw his toned down knife sharpening tutorial, McCutcheon is forced to jump right into the fire and give it a try on her own. 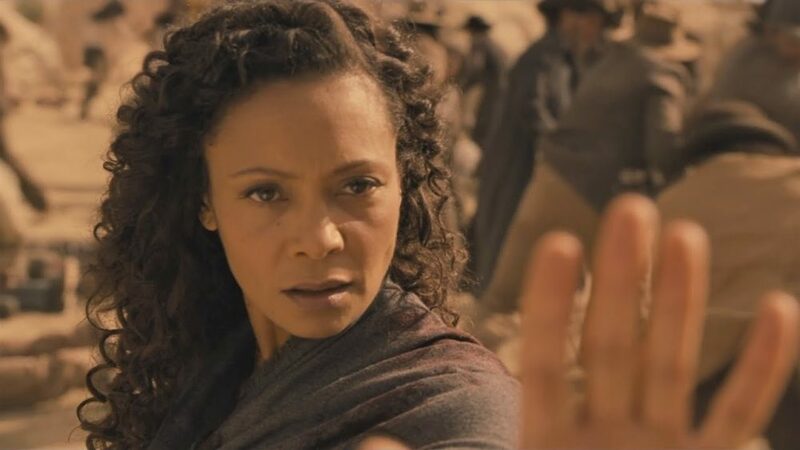 After first teaching her the proper names of the equipment, and teaching her that a knife sharpening steel is NOT used for measuring rings, Ramsay hands McCutcheon the utensils and stands behind her to help her out. He holds her hands and makes her sharpen the knife despite her nerves, and they even pick up some speed doing it. He then backs away and makes her sharpen it with her eyes closed, which is something that you probably shouldn’t try at home! 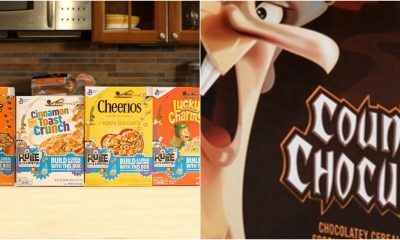 What happens when you combine a culinary master with the queen of comedy? A hilarious and slightly dangerous demonstration, or at least that’s what happened when Chef Ramsay joined up with Ellen Degeneres on The Ellen Show. Ramsay decides to show Ellen how to cook a vegan stir fry, and she pitches in with some of the prep as well. He sounds like safety is a high priority for him when telling Ellen to be very careful while cutting the carrots, and tries to show her proper cutting technique on a red pepper. But his safety demonstration goes amiss when he actually cuts himself while lecturing Ellen on safety! He jokes that it will be okay, because “it’s convenient since it’s a red pepper, so you won’t see the blood.” Gross Chef Ramsay! The show must go on, and Ramsay jumps right back into cutting up the pepper, only cracking once to ask for a bandage! 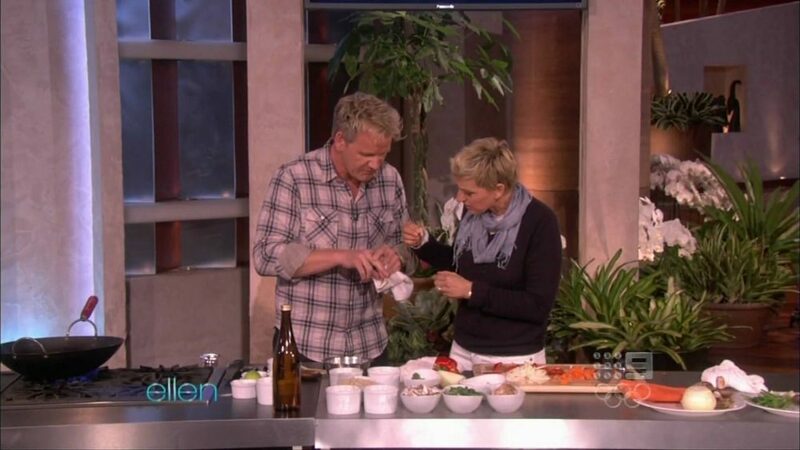 Ellen grabs one for her injured guest, and he continues to cook in a wok with occasional breaks to stem the bleeding with a towel as Ellen struggles to open the bandage wrapper. It’s finally revealed that Ramsay didn’t just give himself a tiny cut, but he actually cut straight through his fingernail and took it clean off. To add insult to injury, Ramsay also exclaims that he thinks the nail ended up in the stir fry… maybe not his best meal!